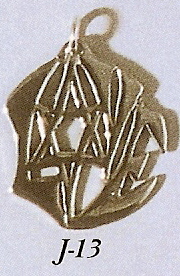 Religious Judaic Jewelry - This is a unique sterling silver English Love pendant that has a Star of David in place of the 'o'. This necklace is medium size and comes with an 18" sterling silver Figaro chain. Sterling Silver Love charm with a Star of David in place of the 'o'. Includes an 18" sterling silver chain.